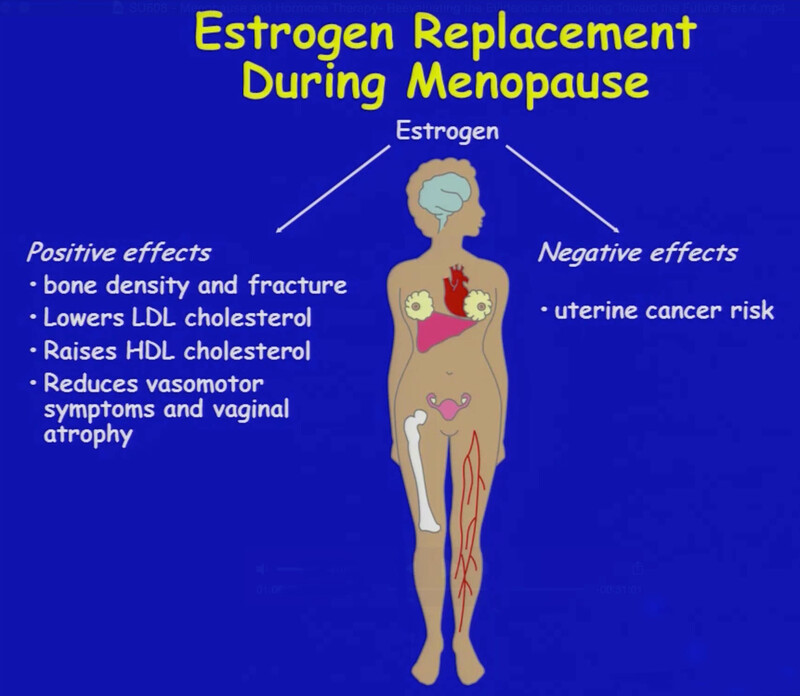 Menopause and Hormone Therapy – What’s New? It was only about 100 years ago that the average woman’s life expectancy increased to the extent she would live past the time of menopause. Now with the average life expectancy into the 80’s, a woman may live more than 1/3 of her life in the menopause. The number of women in the menopause is increasing and expected to go up even more. The consequences of menopause include hot flashes, night sweats, insomnia, skin changes, mood changes, depression, anxiety, irritability, loss of libido, vaginal atrophy, cardiovascular disease and weakened bones. How can hormone therapy be safely used to help treat this problem affecting so many women? We need to put hormone therapy in perspective, and also consider risks and benefits of treatment. Although there is a lot of controversy in the media, patients look to their doctors to be their advocates and give good advice about treatment. It’s our duty as doctors to be informed and advocate for our patients. We need to treat disease in a preventive way, rather than wait for the damage to be done. Disease often starts off in a pre-clinical way, and with some diseases it can be difficult to detect early on. Many diseases that occur have their roots decades before they can be detected, and similarly their treatment may take time to demonstrate a benefit. Hot flashes are one of the most bothersome symptoms of menopause. 50% of women have them longer than 4 years, 23% more than 13 years. Temperature regulation helps your body maintain the proper temperature by causing sweating when you are hot and chills when you are cold, thus maintaining a neutral zone of comfort. Hot flashes are a disturbance of this system which are thought to be due to a change in the temperature regulatory system where a decrease in estrogen causes a decrease in the size of the normal thermo-neutral zone in-between sweating and shivering. The end result can interfere with your sleep and your comfort. Combination estrogen and progestin therapy is FDA approved to treat menopausal hot flashes, prevent osteoporosis, treat vaginal atrophy, and provide other benefits to reduce insomnia, irritability and short-term memory loss. Hormone therapy is highly effective to relieve hot flashes, both their amount and intensity. In women who have a uterus, estrogen alone therapy can increase the risk of uterine cancer, but the increased risk is removed once progesterone therapy is added to estrogen. In 2002 the Women’s Health Initiative study came out and revealed risks of this treatment, including an increased risk of heart disease, stroke, blood clots and breast cancer when both estrogen with progesterone are taken. This had the effect of scaring women into avoiding estrogen therapy even though the absolute risk was only 8 per 10,000 women and the study was based on doses higher than are in use today. This risk is roughly equivalent to the risk of dying in a car accident, and is relatively rare. Rather than being misled by percentages of change, it’s more scientific to consider the absolute risk, and when the risk is less than 1 per 1000 you must weigh that small risk against the improvement in relieving symptoms you get with the right treatment. Other variables to consider include age and method of treatment. Women receiving hormones in the age group of 50-59 have a much less risk of coronary heart disease, stroke, and breast cancer than those in the 70-79 age group. Also women who receive estrogen through a transdermal patch have a significantly reduced risk of a blood clot compared with oral treatment, possibly due to a more stable delivery system and avoiding metabolism by the liver where clotting proteins are made. Having had a hysterectomy means that hormone replacement therapy need only include estrogen, which is the hormone that conveys most all of the benefits and very little risk. This good hormone decreases the risk of heart disease, protects against breast cancer, and reduces damage to blood vessels with benefits in the brain leading to less risk of Alzheimer’s disease. Women who don’t have a uterus are in a much better position because the only major risks to consider are those related to blood clots and much of this risk can be reduced by getting estrogen through transdermal medications that don’t affect the liver where clotting proteins are made. There are benefits in vaginal lubrication, increased vaginal thickness, better sexual function, better support of the bladder, improved bone strength and decreased cancer of the colon. Having a uterus makes treatment more complex, because an progestin needs to be added to treatment to decrease the risk of uterine cancer. But what if there were a medication available that can still provide estrogen benefits without the progesterone risk? Well, there is a new type of estrogen now available called a SERM, or selective estrogen receptor modulator, and when combined with a traditional estrogen, its called a TSEC, or tissue selective estrogen complex. The new estrogen has been designed to have some progesterone-like beneficial effects on the uterus (but without a progestin) and also when combined with a traditional estrogen conveys an improved quality of life, more satisfaction with treatment, improved vaginal health, improved sleep, improved bone density, significantly less hot flashes, with less breast pain and less bleeding. The new medication, Duavee, combines an estrogen with a synthetic “designer” estrogen called Bazedoxifene and represents an improved hormone therapy for those women who have a uterus. While combined traditional hormone replacement therapy can still be used for the majority of women being treated, there are groups of women who are particularly good candidates for this new approach, including women with a family history of breast cancer, women who have had a problem with combined therapy such as tender breasts, those with increased breast density, or if they have had bleeding issues. We need safe and effective treatment for menopausal symptoms. The risk of breast cancer is slightly increased with hormone therapies that combine estrogen with progesterone, but not with estrogen alone or in combination with a new estrogen (called a SERM). TSECS combine an estrogen with a SERM to provide relief of menopausal symptoms without the increased risks caused by progestins and offer a new, safer treatment for menopause. These new developments in hormone therapy are just the beginning of designing new safe treatments that provide more benefit at less risk. This information is from a course “Menopause and Hormone Therapy” given at the 2015 ACOG Annual Clinical Meeting and was presented by Drs Hugh Taylor and JoAnn Pinkerton. This entry was posted in Gynecology, Our Office. Bookmark the permalink.